Ballast water management poses problems in design and operation of ships. Computational fluid dynamics (CFD) offers solutions with design, type approval and trouble-shooting. Computational fluid dynamics (CFD) denotes collectively techniques for solving equations describing the physics of fluid flow. CFD is by now widely known and accepted in the maritime industry, but mostly associated with flows around the hull and propellers, for example in the context of designing more fuel-efficient ships. However, CFD is in many ways far more versatile than classical model testing. The same software can be applied to a variety of flows, including also internal flow problems. A key advantage of CFD is the insight into flow details. As flow quantities are computed (and stored) at many discrete locations in space (computational cells) and for many time steps, it is easy in post-processing to look at arbitrary cross-sections and zoom in and out at will. Ballast water management systems have moved into the spotlight for ship operators with recent IMO regulations which drive the transition towards ballast water management to curb the spread of invasive species. But apart from the particularities of the new regulations, ballast water handling may pose challenges for ship operators where the advantages of CFD simulations come into play. The following case studies illustrate problems and solutions taken from industry experience. The ballast water of ships carries plants and animals which frequently settle in foreign sea regions, representing a danger for the indigenous aquatic environment, potentially causing great ecological, health-related and economic damage. The growing ship traffic has increased this threat considerably. The IMO “International Convention for the Control and Management of Ships’ Ballast Water and Sediments” requires a ballast water management plan. Starting from the year 2016, all ships will have to base their ballast water management on ballast water treatment. If this treatment is based on chemical approaches, rapid and effective mixing of the chemical component with the ballast water is vital to achieve a homogeneous concentration of the biocide. For type approval of new systems, simulations can be a valuable tool. In one case, FutureShip simulated the mixing of chlorine and ballast water in pipes during the ballasting operation. The CFD simulations were used to determine the required pipe length of the mixing zone to ensure homogeneous mixing. Simulations showed that the mixing in the initial design was inefficient. Very simple and cost effective modifications of the inlet geometry served to increase the turbulence level significantly with a resulting much shorter pipe length for complete mixing. Figure 1 shows compute streamlines and chlorine concentration in the mixing pipe resulting from one such simulation. The authorities accepted the simulations as engineering proof for type approval. Sediments tend to collect in ballast water tanks. They reduce the deadweight (payload), restrict water flow thus delaying de-ballasting, and increase draft resulting in higher fuel consumption. For a Capesize bulk carrier, the ship owner wanted to reduce sediment accumulation and tasked FutureShip with detailed analyses and suggestions for re-design in order to minimize sediment settling in the ballast tanks. In this case, the actual sediments were not modelled. Instead, engineering insight facilitates the simulation. Sediments settle in regions of low water speed, as found typically in areas of recirculation and flow stagnation; these are commonly referred to as dead-water regions. Figure 2 shows sediments in a real ballast water tank. The two-phase (water and air) simulations of flow in ballast tanks first identified dead-water areas corresponding to observed sediment accumulation in the original design. Figure 3 shows computed velocity distribution near bottom wall. Then various design alternatives for the ballast water tanks explored variations of stiffener spacing and cut-outs. The simulations identified the alternative design with least sediment settling (i.e. smallest dead-water regions) for future bulk carrier orders. A busy coal terminal in Latin America had given strict time limits to de-ballast a bulk carrier at quay. The ballast pump was taking in air during de-ballasting, forcing the crew to stop de-ballasting intermittently. As a consequence, the vessel could not be de-ballasted in the time given by the terminal. The vessel had to leave with 3000 t of ballast water still in the tanks. As a consequence, 2600 t of cargo could not be loaded, resulting in 125,000€ damage claims and the vessel being blacklisted at the terminal. A detailed analysis is often the first step in trouble-shooting. Once the problem has become transparent, the solution is straight-forward. In this case, the first step was thus to simulate the de-ballasting process, setting up a three-dimensional model of the ballast water tanks and mimicking the pump by a prescribed flow rate at the outlet of suction pipe. The outflux was set to the maximum pump capacity. The simulation of the two-phase flow revealed that the water level in neighboring fields was much higher than in the field with the ballast pump intake during de-ballasting. Figure 4 shows the uneven water levels in various tanks sections. The size of the water-flow openings in the longitudinal frames was too small for de-ballasting rate of the pumps. The simulation provides information about the time-dependent flow rate through each opening and predicts the time at which air begins to be sucked by the pump. The animation of free surface motion and velocity distribution in various cross-sections gives engineers a direct insight into the physics of the flow and allows an easy assessment of the problem, aiding the design of necessary geometrical modifications. Based on the analysis of simulation data, more and larger water-flow openings for the frames in the vicinity of the pump were suggested to synchronize fluxes through openings with the pump intake flux. Size and location of the water-flow openings could then be determined such that the inflow toward the pump was above the pump rate, thus avoiding the risk of the pump taking air. 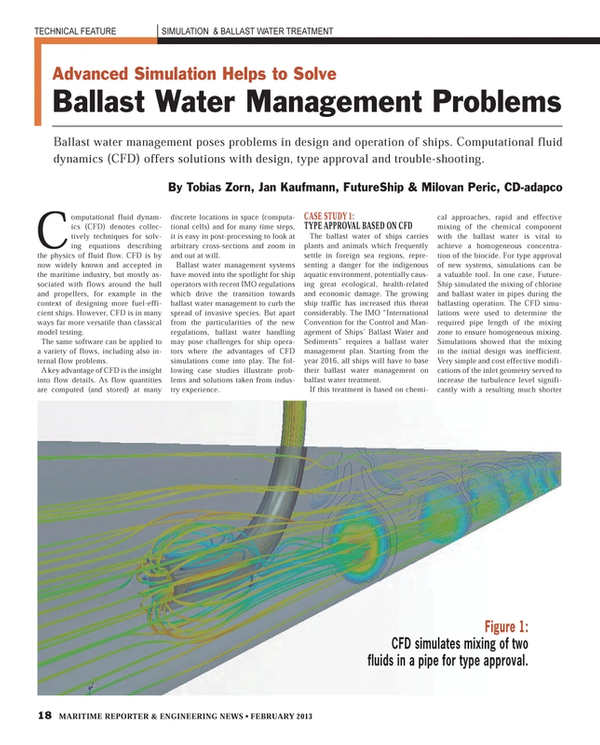 CFD simulations have proven to be a versatile and powerful tool to support design and operation of ballast water management systems. The combination of advanced computational software and expert users yields detailed insight and reliable answers. The authors appreciate the help and cooperation of their colleagues Volker Bertram and Jan Rüde. The simulation employed CD-adapco’s CFD software STAR-CCM+. This software is capable to simulate turbulent flow with resulting eddy formation and turbulent mixing, as well as multiple fluids with resolved liquid-gas interfaces. It is thus able to capture all important physics for the analysis of ballast water flows as presented here. The solution method is based on conservation equations in integral form with appropriate initial and boundary conditions. The solution domain is subdivided into a finite number of control volumes which can be of an arbitrary polyhedral shape and are typically locally refined in regions of rapid variation of flow variables. The time interval of interest is also subdivided into time steps of appropriate size. The governing equations contain surface and volume integrals, as well as time and space derivatives. These are approximated for each control volume and time level using suitable finite approximations, leading to an algebraic equation system which can be solved efficiently on a multi-processor computer. The flow is assumed to be governed by the Reynolds-averaged Navier-Stokes equations. Turbulence effects can be accounted for by a variety of models, from the simplest eddy-viscosity type models (k- or k- models are typically used) up to the Reynolds-stress models. Thus, the continuity equation, momentum equation, and between two and seven equations for turbulence properties are solved. Large-eddy simulations, which model only the small-scale turbulence and resolve large-scale eddies, are also possible. Multi-phase, multi-component systems (water-air or water-chlorine in the applications shown here) can also be simulated. The spatial distribution of the phases (liquid and gas) is obtained by solving an additional transport equation for the volume fraction of each additional phase. To accurately simulate the convective transport of immiscible fluids, the discretization must be nearly free of numerical diffusion. For this purpose, a special high-resolution interface-capturing (HRIC) scheme is used, providing a sharp resolution of free surfaces and allowing simulation of flow with trapped gas bubbles in liquid or liquid blobs in gas. Dipl.-Ing. Jan Kaufmann and Dipl.-Ing. Tobias Zorn are both working as Senior Project Engineers in the Engineering Unit Fluid Dynamics at FutureShip GmbH - a Germanischer Lloyd company in Hamburg, Germany. Prof. Milovan Peric is Vice President - Technology at CD-adapco, an independent CFD-focused provider of engineering simulation software and is based in Nuremberg, Germany.